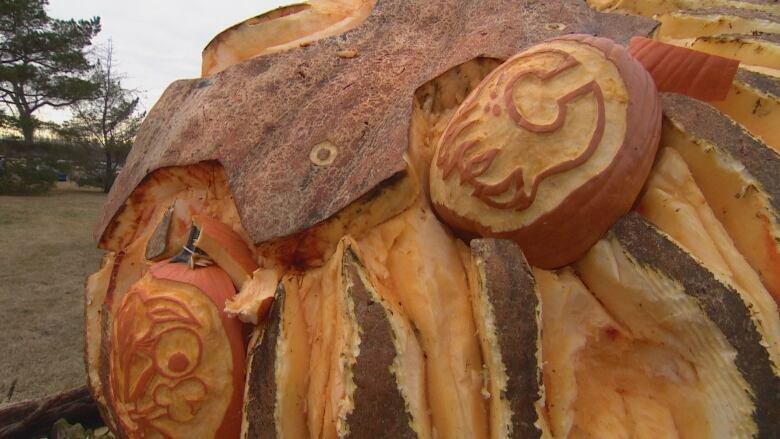 A giant pumpkin has been transformed into an Oilers-themed jack-o'-lantern, after Edmonton donors squashed the Calgary competition in a Battle of Alberta-style fundraiser. 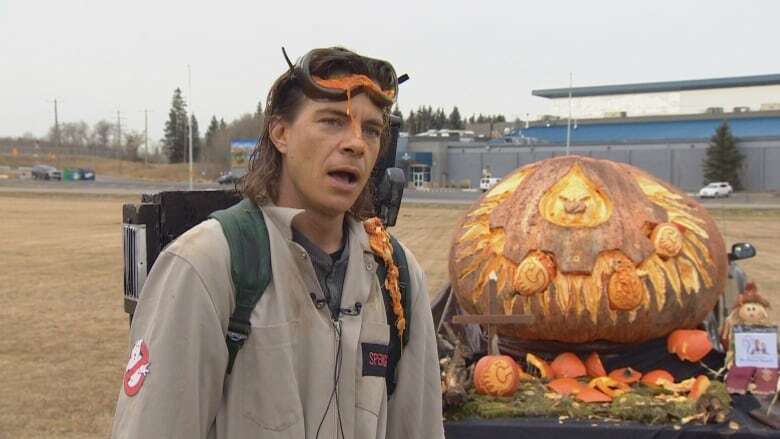 Professional pumpkin carver Robbie Beniuk promised to carve the 1,884-pound gourd into either a Calgary Flames or Oilers theme for Halloween, depending on which city could raise more money for Little Warriors. About $4,200 of the estimated $5,500 total raised came from Edmonton donors, Beniuk said. All proceeds are going to the charity, which works to prevent and treat child abuse. "Edmonton took it down and became the City of Champions," Beniuk said. "Calgary had a good start but they came a little slow in the second week." The carver went to work on the giant pumpkin all throughout the night and into Wednesday morning. The result is a Halloween monstrosity of gnarled teeth crushing regular-sized pumpkins emblazoned with Calgary Flames logos. Five gears represent each of the Oilers' Stanley Cups, and there are oil drops for eyes. A smaller pumpkin, carved with a Flames logo, sits below, underneath a cross. Parked on a flatbed trailer, the giant jack-o'-lantern with be on display Halloween night at the Ardrossan Recreation Complex. "It's a little messy, but we did what we had to do, you bet. Eventually it submitted," Beniuk said. "Carving this guy, you know, we gave it 110 per cent. It really fought hard but we put it down where it needed to go, and we came through in the end."